Tea Time Games Recipes For Children and Kids! Both tea time games recipes are simple and easy to make, keeping your little monsters happy and occupied before they even start eating! There is no reason why you can’t have fun and games at tea time. Fun with food is an essential way to get kids involved in cooking. The thing is, my kids always want sweets and cakes but I don’t want them to have them every day. So I have found some fabulous healthy tea time games and treats that won’t rot their teeth or fill them with additives and grease! Dried fruit gums - Try these fruity shapes as an alternative to sugary sweets – they are delicious and nutritious, my kids adore them. 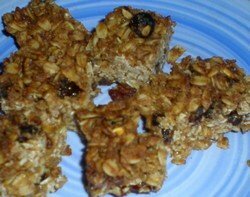 Flapjacks - The traditional flapjack is always a good, filling alternative to biscuits – the complex carbs will keep them going for hours and they go well with a hearty drink of milk for extra calcium. Baking time: A few hours on a very low heat, or overnight. Equipment needed: Food processor, baking tray, greaseproof paper, palette knife, small cookie cutters. Step 2: Put the fruit into a food processor and whizz up until pureed smoothly. Step 3: Pout the mixture onto greaseproof paper and spread thinly. Step 4: You can either bake overnight at 150 degrees or at 160 degrees for 2 or 3 hours. Step 5: The mixture is ready when it is firm – this will depend on how moist the fruit was so keep an eye on it. Step 6: Place on a wooden board and peel off the paper. Chop into tiny squares or cut out shapes with mini cookie cutters. Step 1: Pre heat the oven to 190 degrees. Step2: Gently melt the butter and sugar in a saucepan until runny. Step 3: In a separate bowl mix the oats, sugar, cinnamon and dried fruit. Step 4: Add to the liquid and mix well. Step 6: Sprinkle over the sesame seeds and cook for 25 minutes. Step 7: Keep in the tin and when cooled a little – after about 10 mins – cut into squares and then into triangles. This is so simple and delicious, your kids will be demanding more!